“Chicken soup…heals the nerves, improves digestion, reduces allergies, relaxes, and gives strength. Food is medicine. What we eat either supports and heals our bodies, or weakens our immune systems. There really is not a lot of middle ground. That is why it is so important to eat whole, nourishing foods. We need to feed ourselves and our families to keep our body and it’s systems strong. The wisdom of our ancestors told us this. Our Grandmothers knew this. That is why chicken soup was “prescribed” by Grandma to cure a cold. The nourishing broth, the potent herbs, and pungent garlic all work together to form a unique synergy to help the body recover, heal, and restore balance. Let’s take a look at what each ingredient of the soup does. 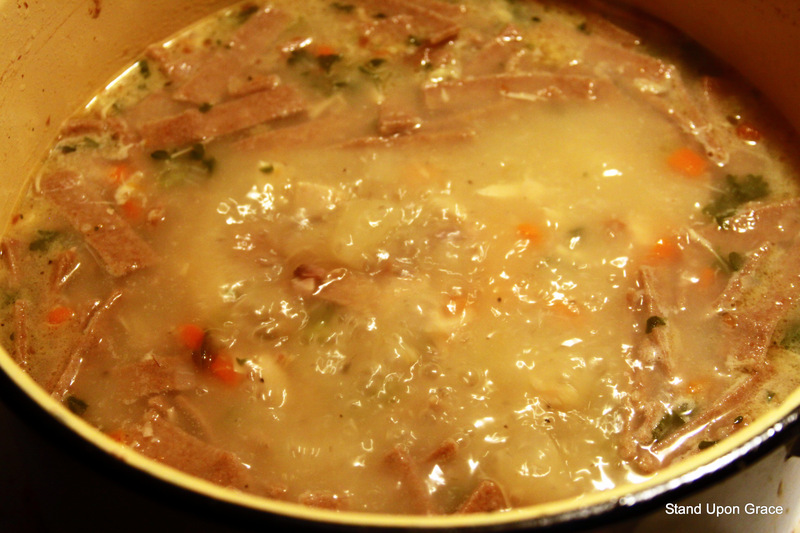 Homemade meat broth is very nourishing, and healing for our bodies. 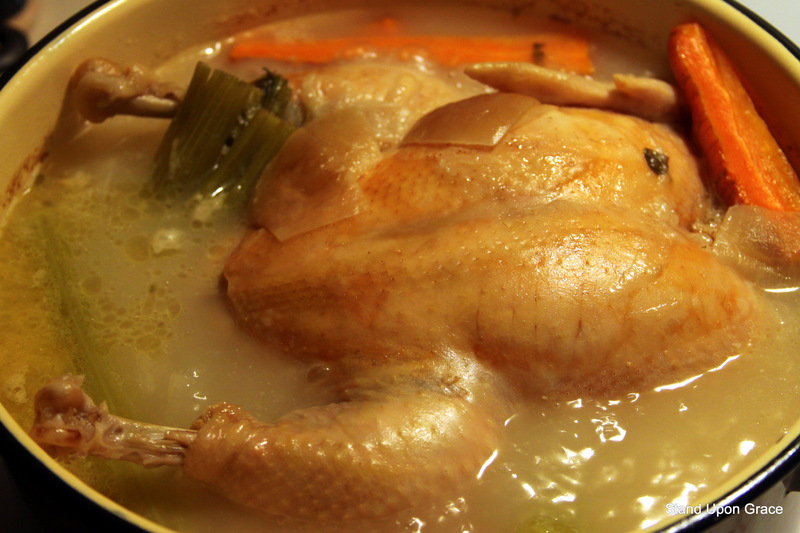 Ancient physicians prescribed chicken broth to cure colds, flus, and asthma. Our ancestors knew that the whole animal was to be used, rather than just cuts of meat. This was a very frugal practice, but done for reasons beyond being thrifty. When we prepare broth from a whole chicken for example, we gain an extremely nutritious cocktail of minerals, from bone, cartilage, and marrow. The vegetables add much-needed electrolytes and vitamins that are easily assimilated within our bodies. 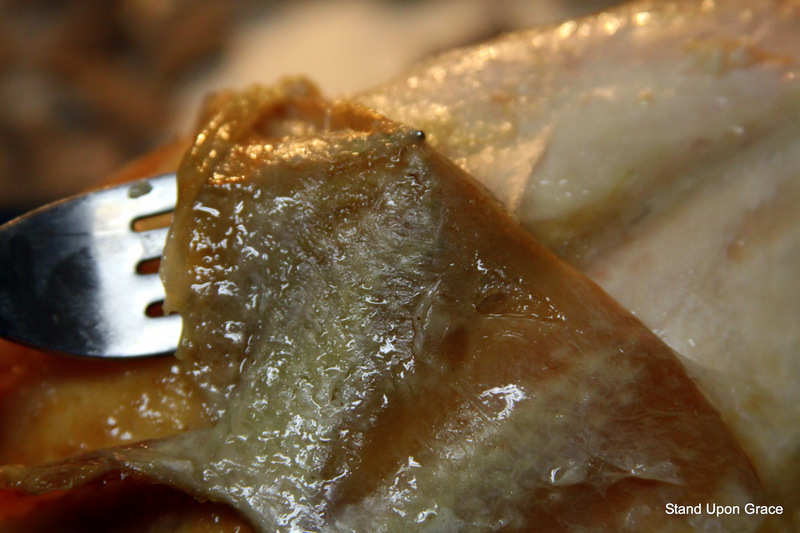 The gelatin in the broth that comes from our whole chicken aids in digestion, is high in protein, and although not complete protein chains, it helps us to better digest the complete proteins. Basically the gelatin acts as a protein sparer, it allows the body to utilize all of the complete proteins that are taken in. Adding onions and garlic help to add to the healing potency of your broth. 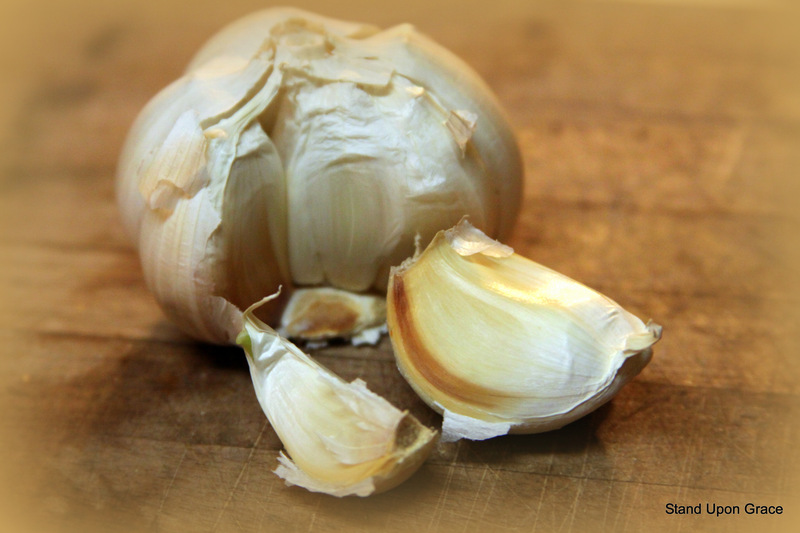 Garlic is high in sulphur, to strengthen the immune system and fight infection. It also contains trace minerals of selenium, and germanium, and is high in vitamin C. Onion helps to reduce congestion, and inflammation. It is high in sulphur compounds as well. The herbs added to your broth, concentrate the power and flavors of the broth making it not only nourishing, but delicious as well. 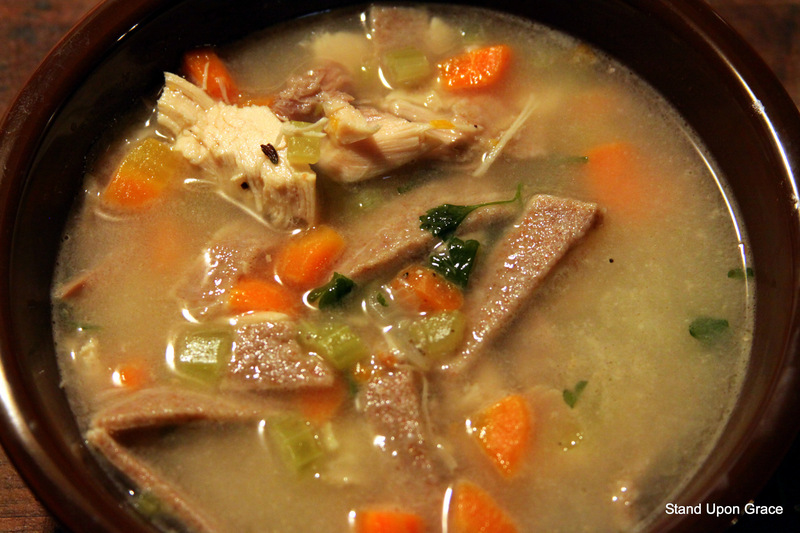 Chicken soup contains the herbs oregano and thyme, which both have very strong anti-viral properties. It also has parsley. 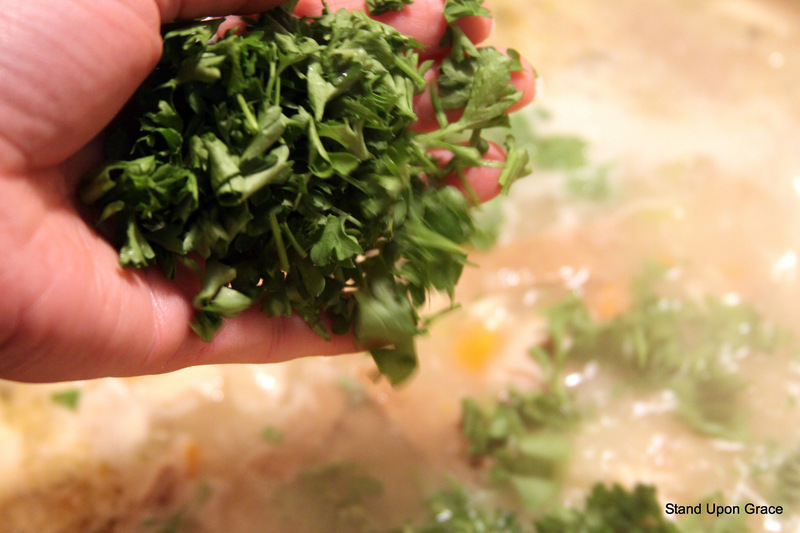 Adding parsley will add valuable additional minerals to your soup. Parsley is also an astringent herb which will help to clear the body of toxins. This adds to the healing power of the broth. Adding a bit of wine or vinegar to your broth helps to draw more minerals from bone, and additional gelatin, making a flavorful, wonderful, healing soup. Modern scientific research is beginning to reveal the “Why’s & How’s” of traditional wisdom. It is proving that Grandma’s Chicken Soup, really is a very appropriate, and healing ‘Medicine’ to restore balance to the body. It is very exciting to see and understand the science behind the wisdom. There is a lot of research out there, have fun exploring! 1 homestead raised whole chicken, If you do not raise your own chickens, please use one that has been raised by organic, free-range practices. 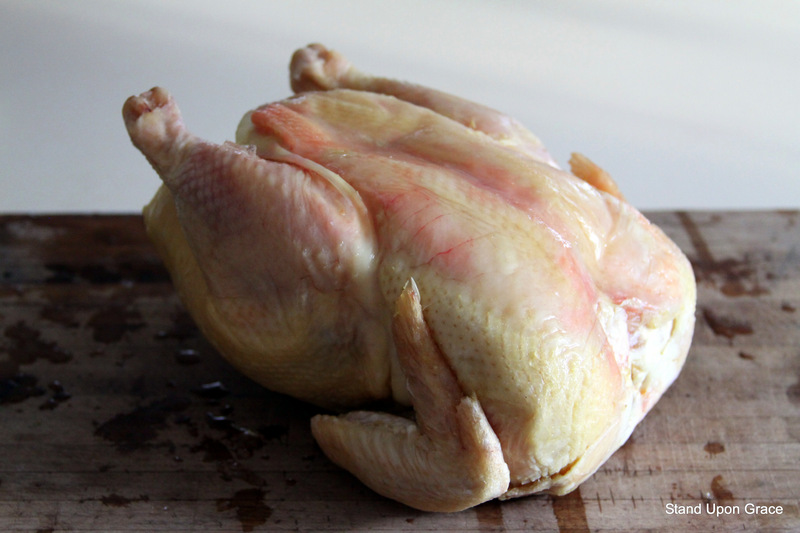 This chicken will produce optimally nutritious broth for you and your family. 4 qts of water, or enough to cover your chicken in the stockpot. Place whole chicken in large stockpot. You may cut up your chicken if you prefer, it does help to release more nutrients from the whole bird a bit quicker, but often I do not do this, I tend to cook it for a longer period of time. Add water and wine or vinegar. Wash and prepare veggies. Add into stockpot arranging around the chicken. Add garlic, onions, herbs, and salt. Bring to a boil. Skim off any scum that may form on top. Reduce heat cover,and simmer for 6 to 24 hrs. Add parsley the last 10 min. of cooking time. The longer the stock cooks, the richer, more flavorful and nutritious it will be. 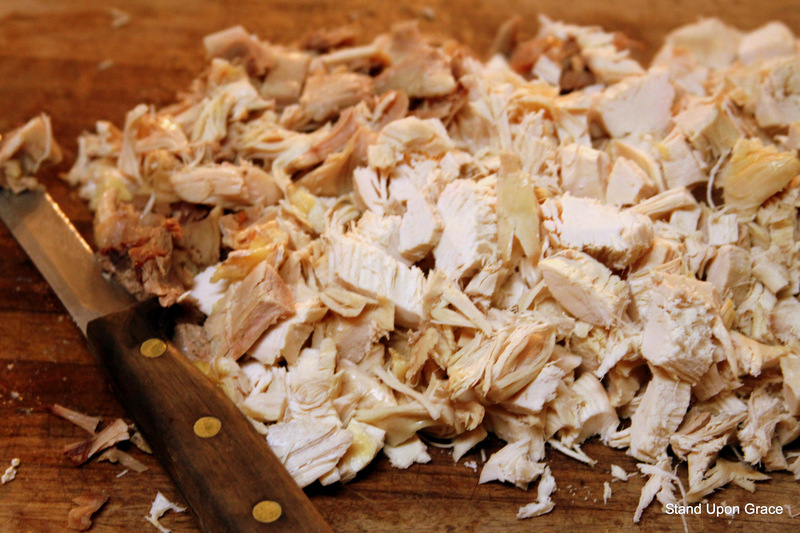 Remove whole chicken pieces from the pot with a slotted spoon. Place on a rimmed baking sheet for use later. Remove veggies, onions, and garlic with a slotted spoon. You may discard these now. I usually put them in my chicken bucket. Allow broth to cool, and place in the refrigerator overnight. Skim fat from the top and prepare to use or freeze broth. Begin with your homestead whole chicken. You may cut it up if you like. Place chicken into large stockpot. You want enough room so the chicken will be covered by 1-2 inches of water, plus have enough room left for boiling. Add water, veggies, onion, garlic, herbs, salt, and white wine or vinegar. Reserve parsley for later. Bring to boil, cover and reduce to simmer for 6-24 hours. Add parsley for the last 10 min. of cooking time. A chicken in every pot…. Remove chicken pieces from the stockpot when desired cooking time is reached. Place on a rimmed baking sheet to catch any juices that will continue to release from the meat. Allow chicken to cool. 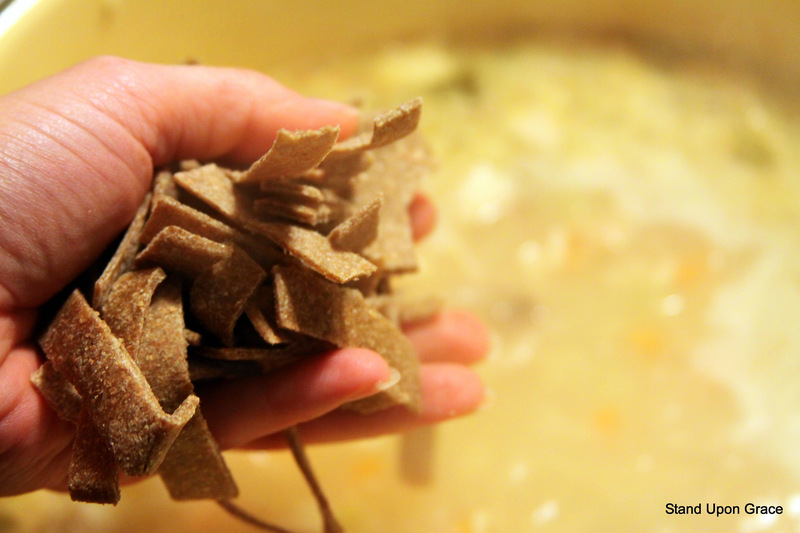 Remove the rest of the solids from the stock. 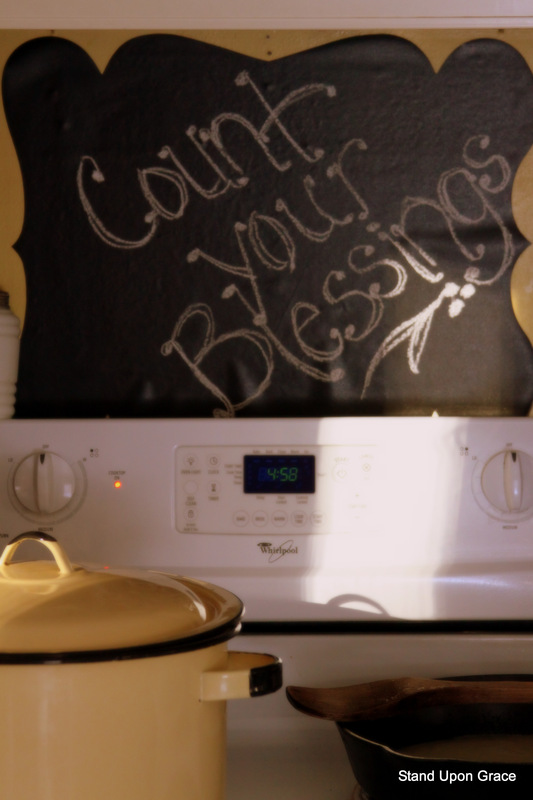 Allow stock to cool for storage, or begin to prepare your chicken noodle soup. 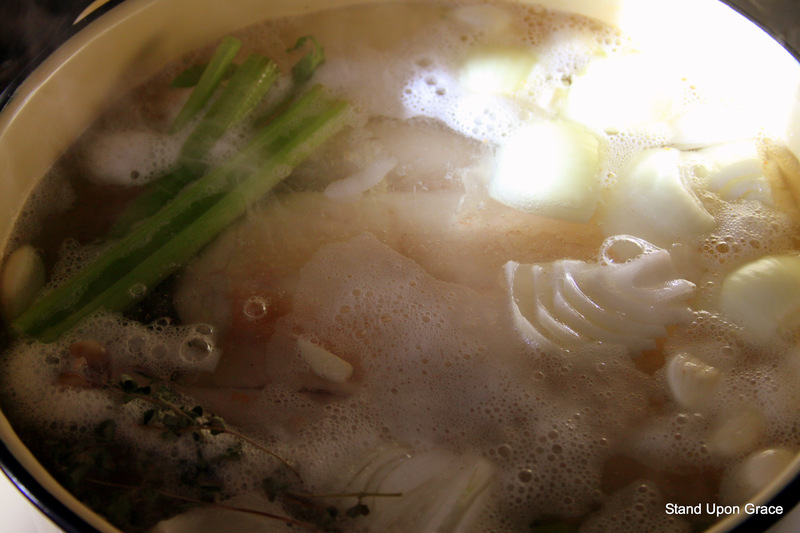 In a large stockpot, warm broth so it becomes liquid again. Add diced carrots, celery, onion, and garlic. Bring to a boil, cover and simmer. Remove skin from chicken, and remove chicken from the bone. Chop chicken into bite-sized pieces. Add to stockpot. Add salt, pepper, and herbs. Simmer on medium low heat 30-40 min. with lid on. Add homemade noodles, and parsley. Simmer for 10-15 min. until noodles are tender. Ladle into bowls to serve. 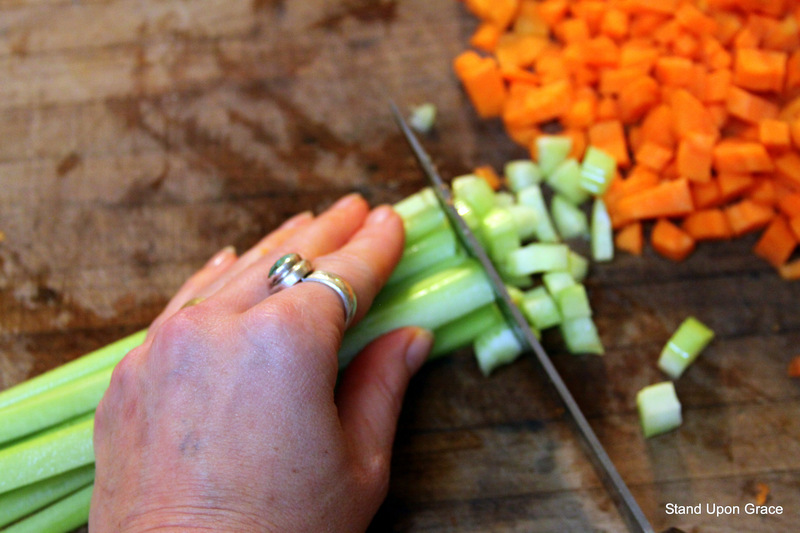 With chicken broth warming on the stove top, begin to prepare your veggies. I used carrots from the summer garden that are now in winter storage. 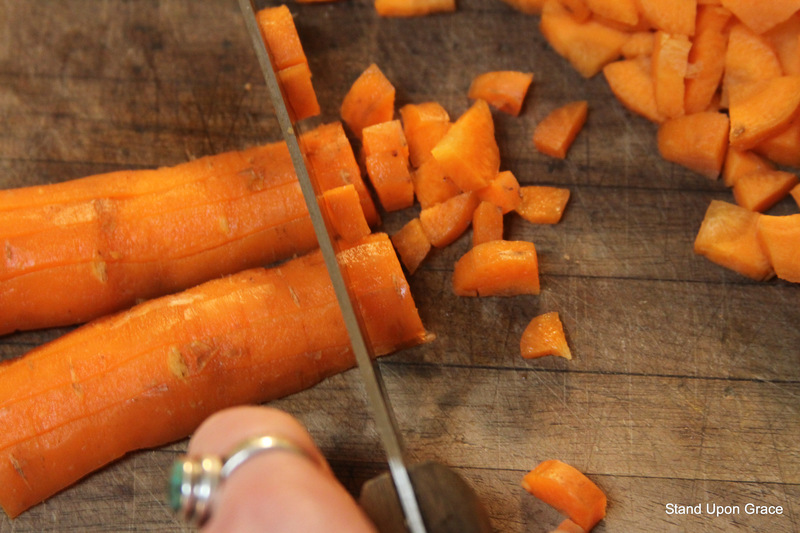 Wash and scrape, or peel carrots. Cut in half lengthwise. 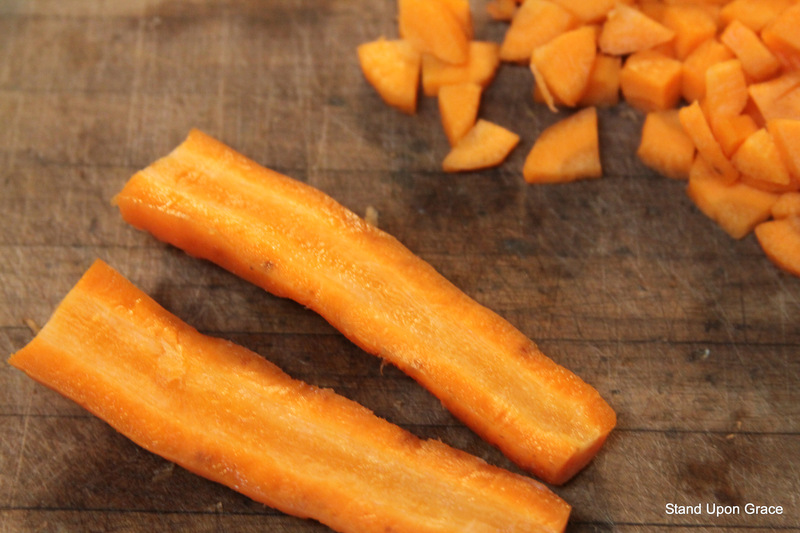 Cut lengthwise into 3 or 4 sticks depending upon the size of the carrot. The bigger the carrot the more sticks you will need to achieve proper size dice. Cut across the sticks to make a nice bite sized dice. 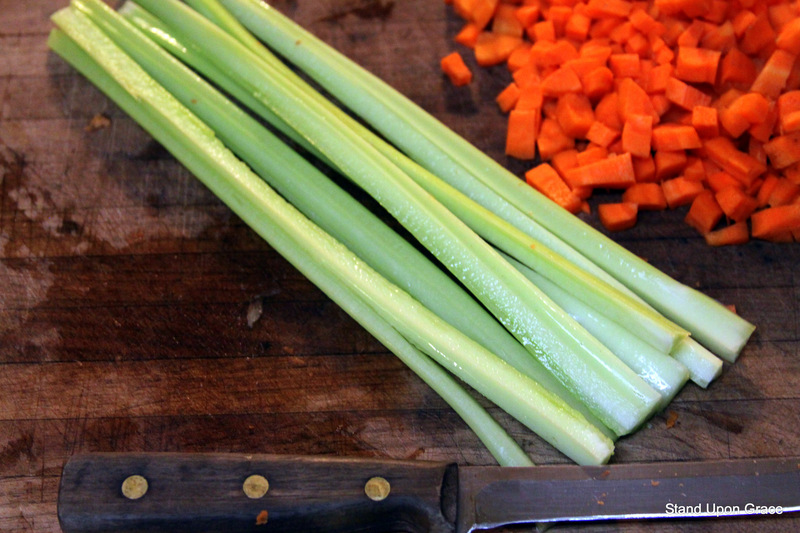 Wash and cut celery stalks into strips lengthwise. Turn celery strips, and cut across to make lovely bite sized pieces. 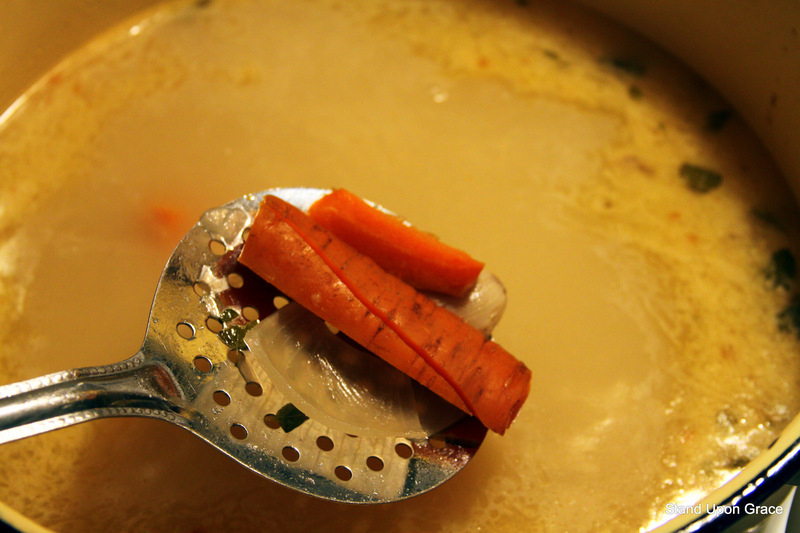 Add carrots and celery to broth. Bring to a boil, reduce heat and simmer. Gather your garlic, and peel. Use either a garlic press or a food processor to mince, peeled garlic cloves. Add to stockpot. Select a large onion. Remove ends, and peel outer paper layer off. Slice across the top of the onion about 1/2 to 3/4 of the way through the whole of the onion. 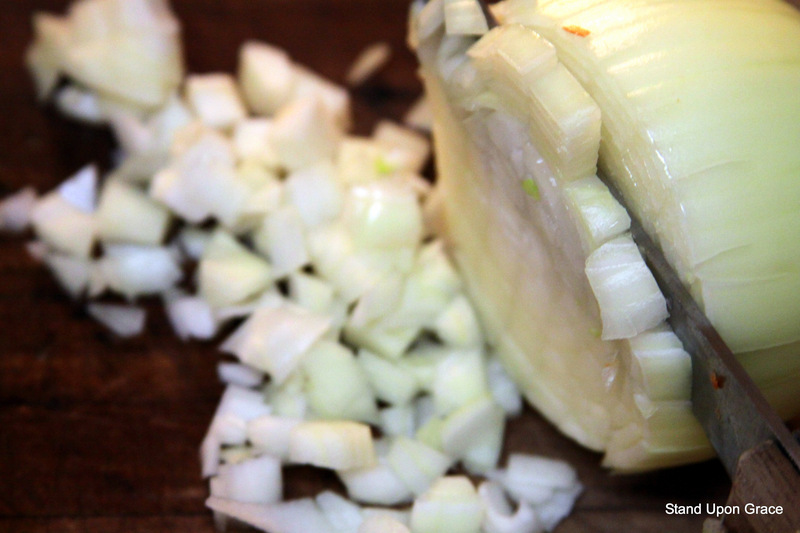 Then turn onion and cut across the cuts the same depth as before. 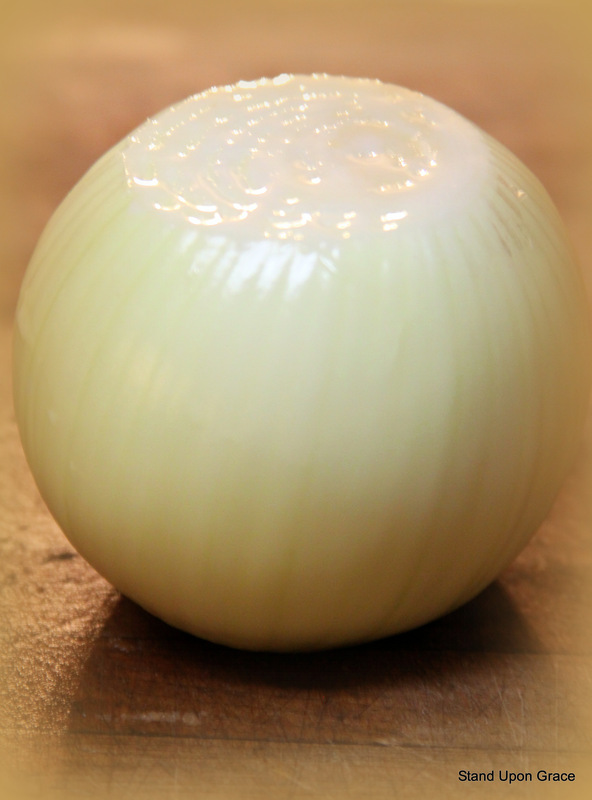 You will see little squares form on top of the onion. 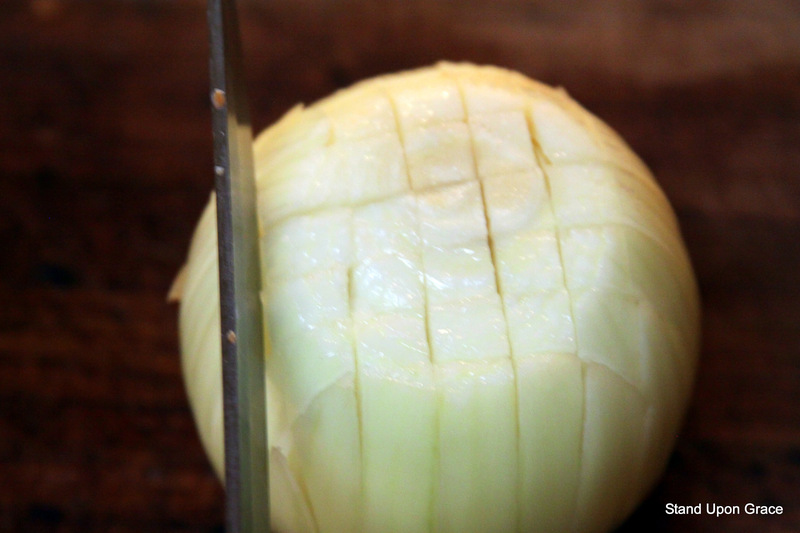 Turn onion on its side and slice down from the top to make 1/4 inch or smaller pieces. Simple and lovely. Add to stockpot. 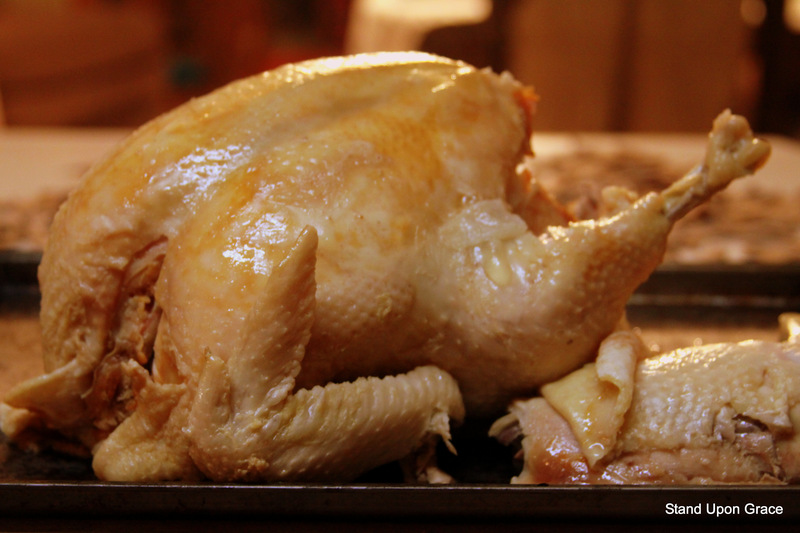 Remove skin from chicken now that it has cooled. 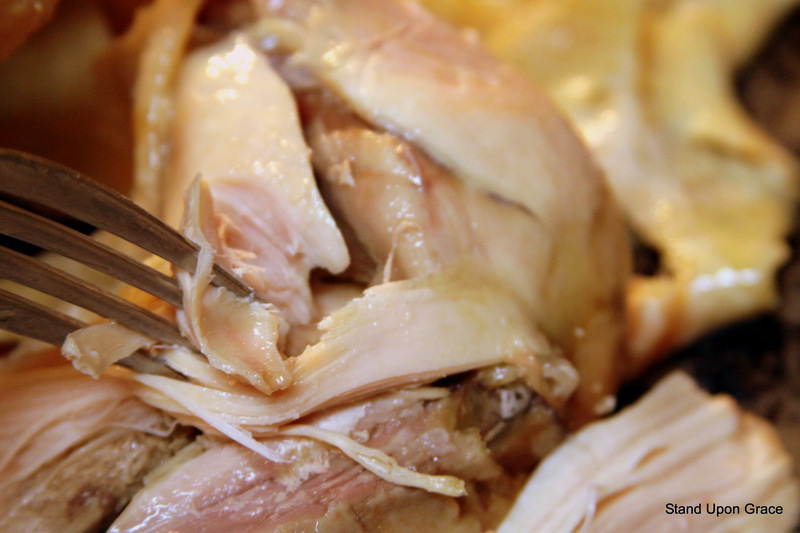 Carefully pull chicken from the bone, using a fork, or your fingers. Just remember that the bone holds in heat, so be careful not to burn yourself if you have not allowed the chicken to cool completely. Chop pulled chicken into bite sized pieces. Add to simmering stockpot. Add prepared homemade noodles to simmering stockpot. Add chopped parsley to stockpot. Simmer for 10-15 additional min. until noodles are tender. Do not overcook, or your noodles will fall apart. *This is my Grandma Dorothy’s homemade noodle recipe. Her chicken and noodles were legendary. This is the same recipe, but used in soup. I have made a change to the flour used. 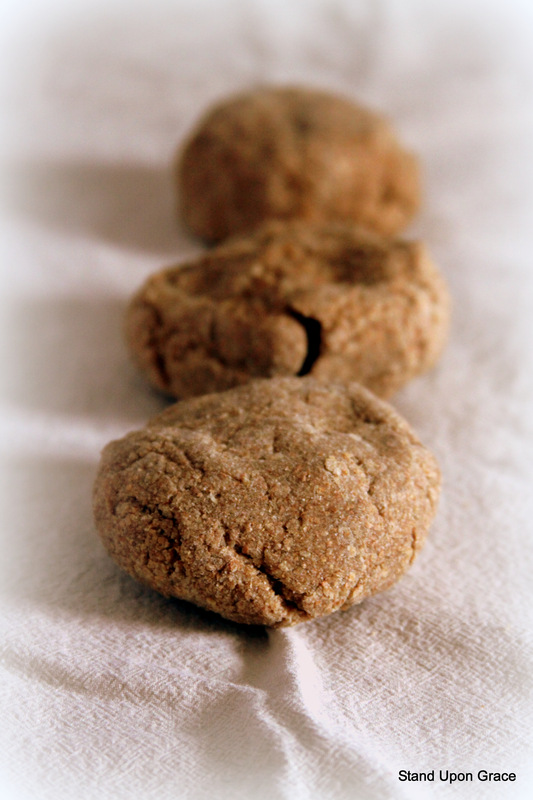 Grandma used Gold Medal Flour, I am using freshly ground hard red spring wheat for this recipe. Although Grandma Dorothy is no longer with us, her love and wisdom remains. Thank you Grandma. 1 whole egg, all farm fresh of course! Divide dough into 3 parts. Shape into balls, and flatten slightly. 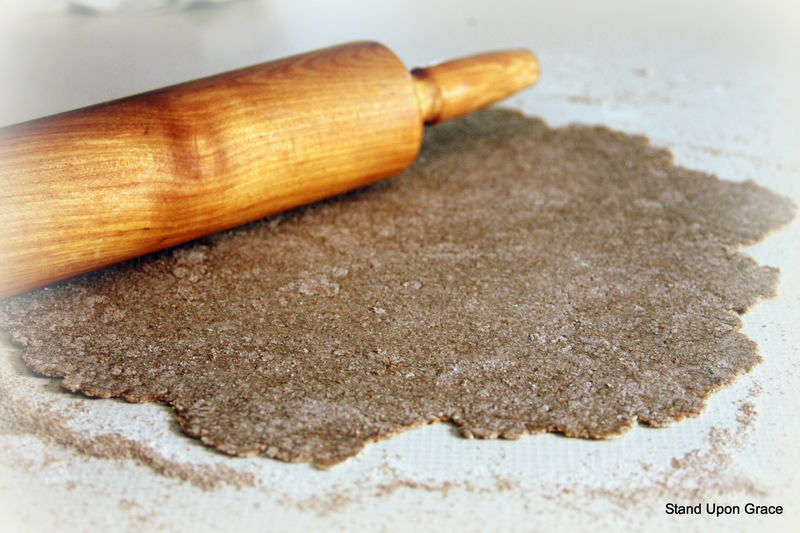 Roll out each piece as thin as possible (paper-thin) on a lightly floured surface. 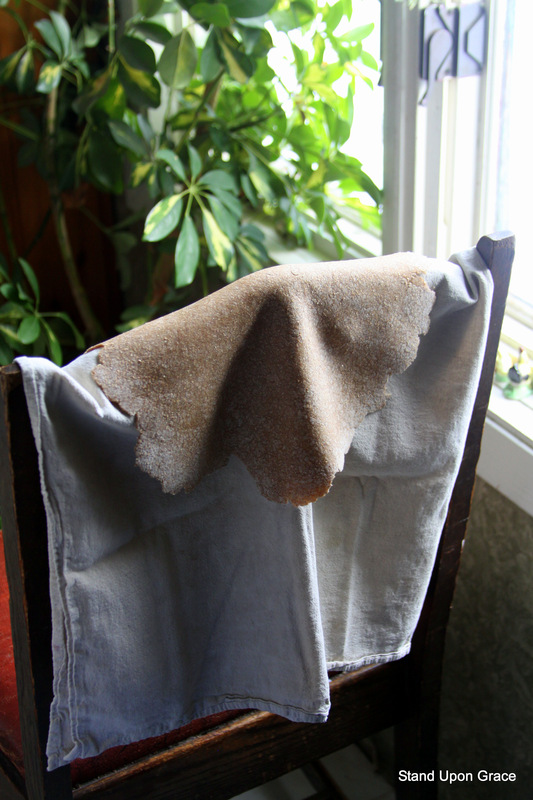 Place each sheet between 2 flour sack towels until dough is partially dry, but still pliable. Roll up sheet as for jelly roll. 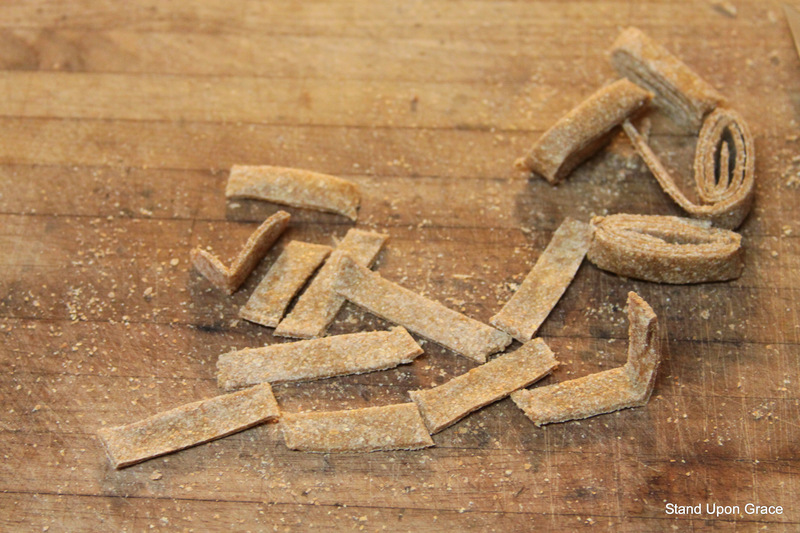 With a thin, sharp knife, cut into strips of desired widths (1/8″ for fine noodles, up to 1/2″ for broad noodles). Cut strips into desired lengths. 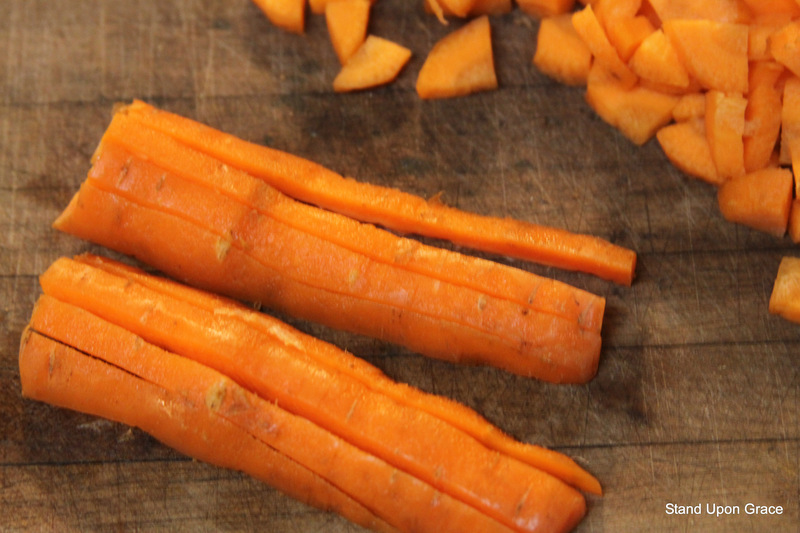 Spread out on countertop or cutting board to dry before using or storing. Makes approx. 6 c.
*After cutting noodles they will need 30 min.-1 hr. or more, of dry time. If using up the noodles fresh, they do not have to be completely dry. Allow to dry completely to store in the freezer for later use. 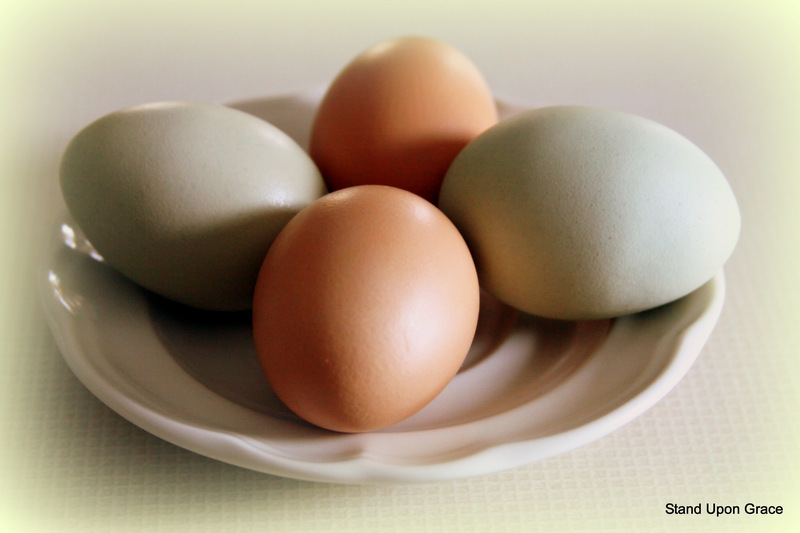 Gather your homestead fresh eggs. Admire how pretty they are 🙂 Give thanks for the happy hennies that provide you with eggs. Homemade noodle ingredients. Simple, wholesome, and nutritious. Separate 3 eggs. 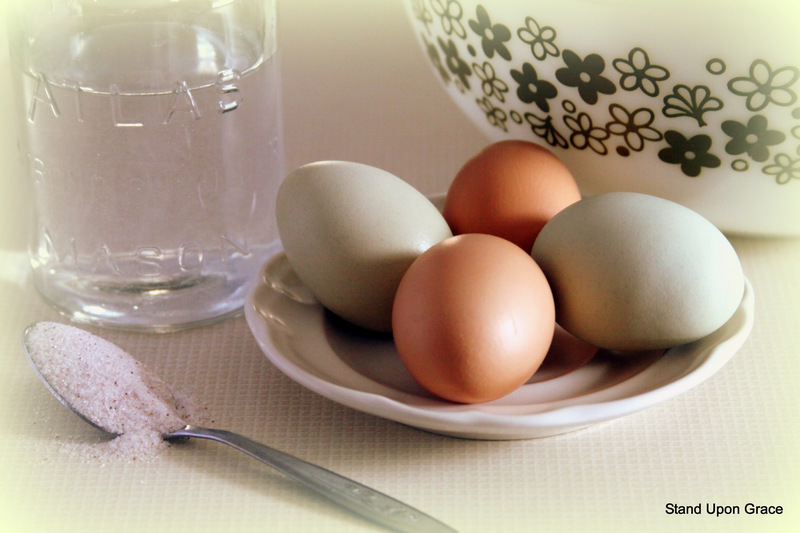 Place whole egg, and 3 yolks in mixing bowl. 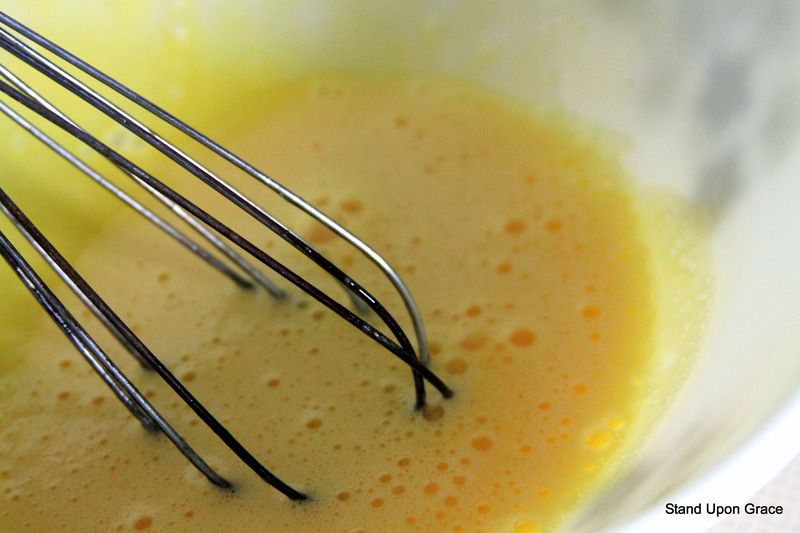 Whisk eggs until light and fluffy, about 1-2 min. Beat in 3 T. water, and 1 t. salt. Add 1 1/2 to 2 c. of flour. 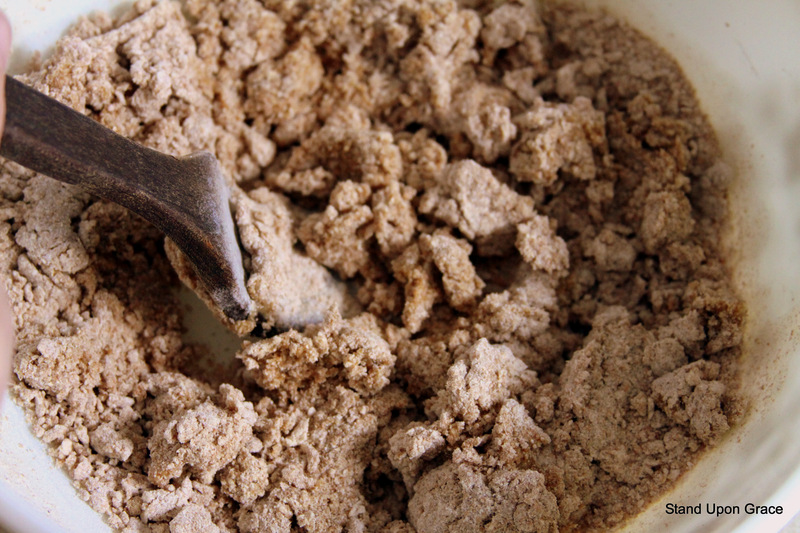 Stir with wooden spoon until it begins to come together. 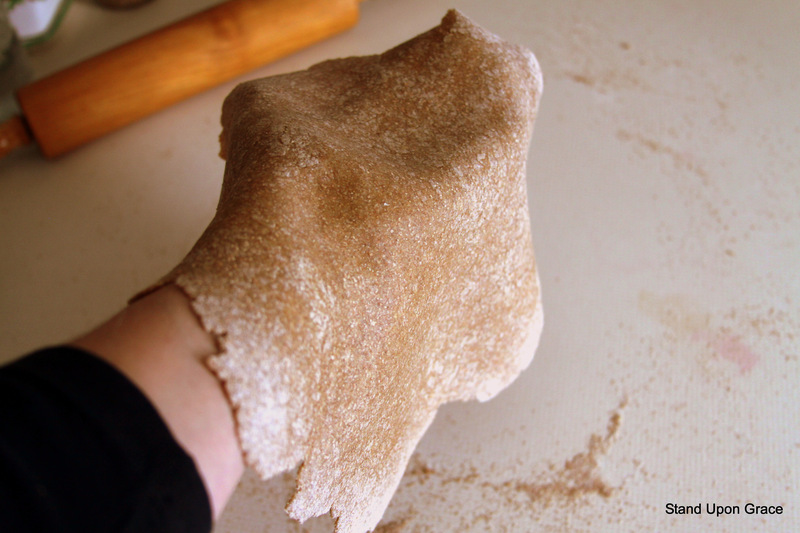 You will need to incorporate the flour with your hands to get the dough to mix. It will be a nice sturdy dough, not sticky. I added a bit too much flour to this batch so it looks a little dry. It still worked out fine, but was harder to roll out. Knead together by hand in your mixing bowl until dough forms a nice ball and is no longer sticky. Divide dough into 3 pieces. Shape into balls, and flatten slightly. Cover with dishtowel to keep from drying out. 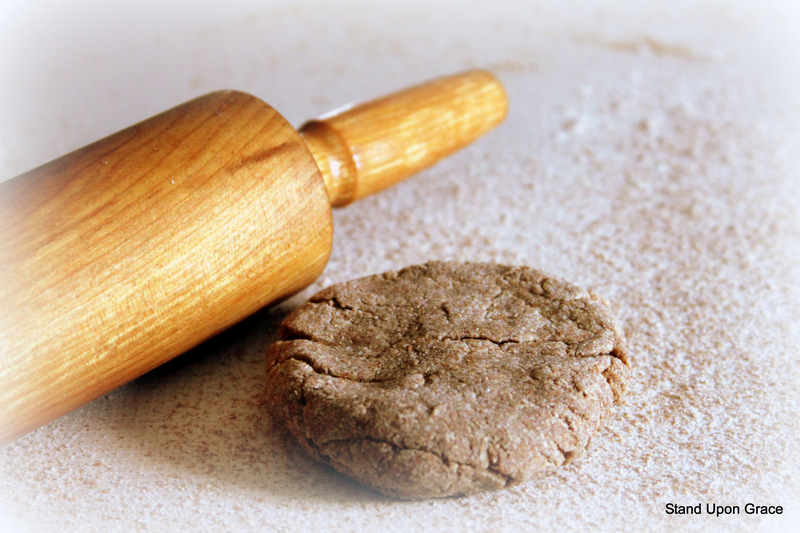 Place one flattened ball on a lightly floured surface to roll out. 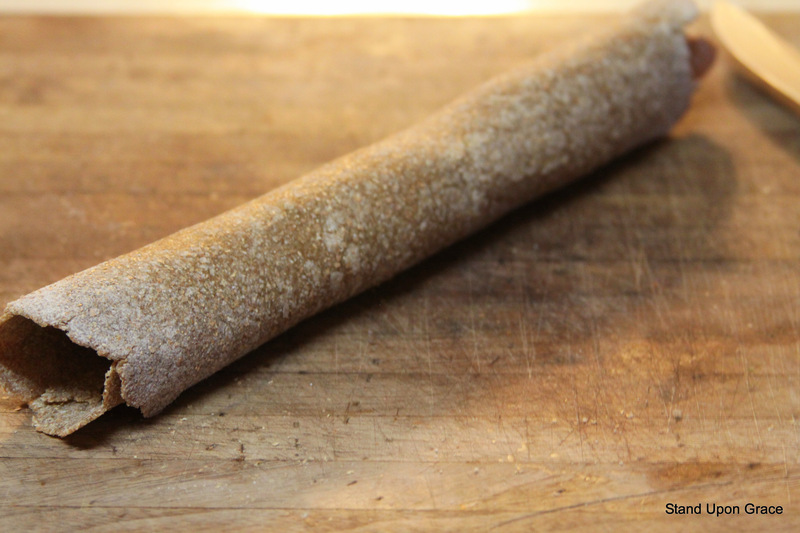 Roll out dough as thin as you can get it. 1/8″ or less. Brush off excess flour. Gently lift sheet of noodles from the counter. This picture didn’t really work well, but the idea is to loosen the sheet of noodles from the rolling surface, and lay it over your arm to move it. This is Davie. 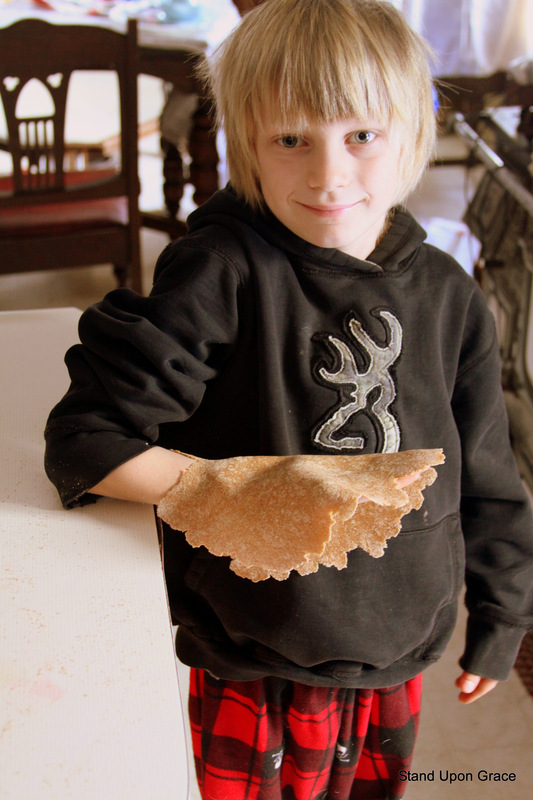 He wanted to help show you how to lay the sheet of noodles over your arm to move them. Such a sweet pea, always willing to help, even when he’s not feeling well. The chicken noodle soup was for him! Place sheet of noodles on a flour sack towel. I hang mine over the back of the kitchen chair next to the heater. This is how my husband’s mom taught me to make their families’ traditional noodles. The noodles dry nicely when they hang. I have also used my drying rack if I am making a ‘bulk’ batch of noodles. Just be sure to place a towel over your ‘rack’ and cover the sheet of noodles with a second towel to protect it from kids & kritters! Drying time will vary. Each season, and each house is different. Noodles dry fastest in the winter. They usually take about an hour to an hour and a half in my house. Just remember that you want them dry, but pliable so that they do not break when you cut them. 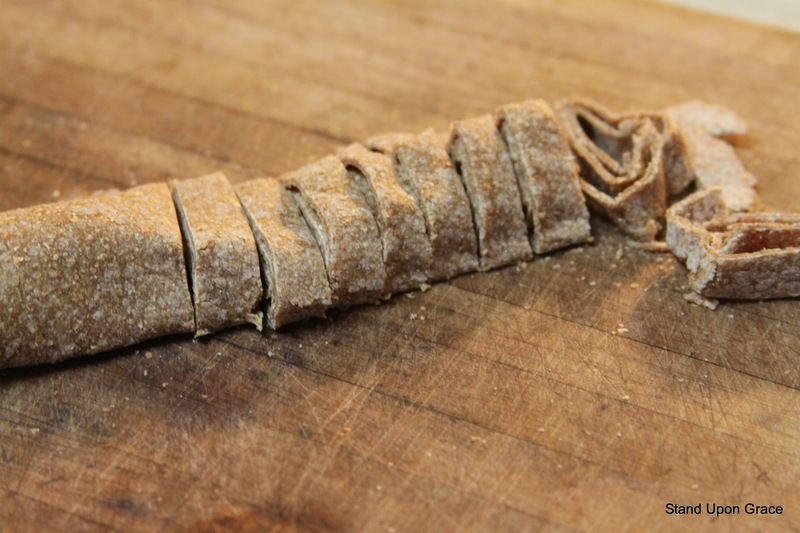 When noodles are dry to the touch, but still pliable, place on cutting board and roll up like a jelly roll. Slice noodles crosswise into desired thickness. 1/8″ for thin noodles to 1/2″ for broader noodles. 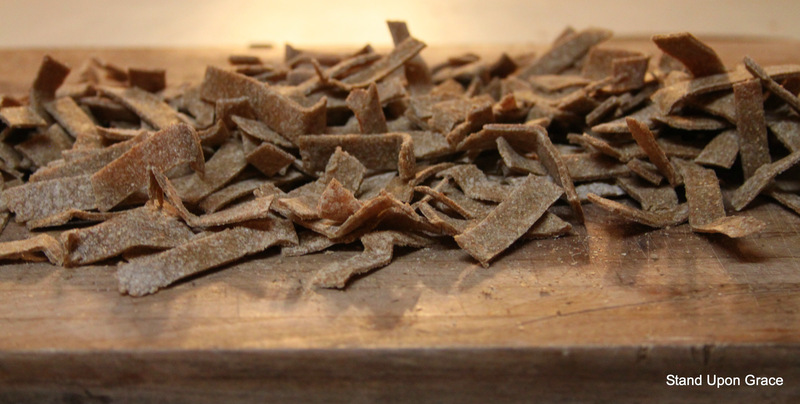 I chose the middle ground, and sliced them about 1/4″ thick. Shake out, and unroll strips of noodles. Cut to desired lengths. Spread noodles out on the countertop, or cutting board to dry. Let dry 1 hour or more. Noodles can be stored in an air-tight container in the freezer, or put directly into a steaming pot of homemade chicken noodle soup! A Wise Mama Knows….Food is medicine, but the best medicine comes from the heart. Nice job, Davie! Wendy, can you explain your “chicken bucket?” I’m intrigued!